Is electric motorcycle racing the next big thing? Is Electric Bike Racing The Next Big Thing? Over in the car world, the Formula E series has gained massive interest from manufacturers. The all-electric racing series is the pinnacle of electric sport on four wheels, and while the early days of the sport were laughable – the cars were slow and there was a mandatory car switch at mid race for range purposes (the next generation Formula E cars are reported to be able to last a whole 50-minute race) – there’s no avoiding the fact that almost every major car maker is embracing electric propulsion as part of their model range, whether its standalone electric cars, or as part of a hybrid system. And just as it’s been true about internal combustion engines, there’s no better way to improve the electric breed than by going racing. Motorcycle manufacturers, meanwhile, have been a little slow to follow suit. The difference in scale between cars and motorcycles is one factor. Another is the fact the major motorcycle manufacturers haven’t been as quick to jump on board the electric bandwagon like the car guys. This could all change, however, with Dorna’s announcement of the Moto-E series starting in 2019. A one-bike electric racing series running alongside MotoGP, the Moto-E series will feature 18 identically prepared Energica Ego Corsa race bikes, fielded by existing teams within the MotoGP paddock. While rider lineups are yet to be announced, the races will be 10 laps long, with bikes claimed to be able to reach a top speed of 155 mph. 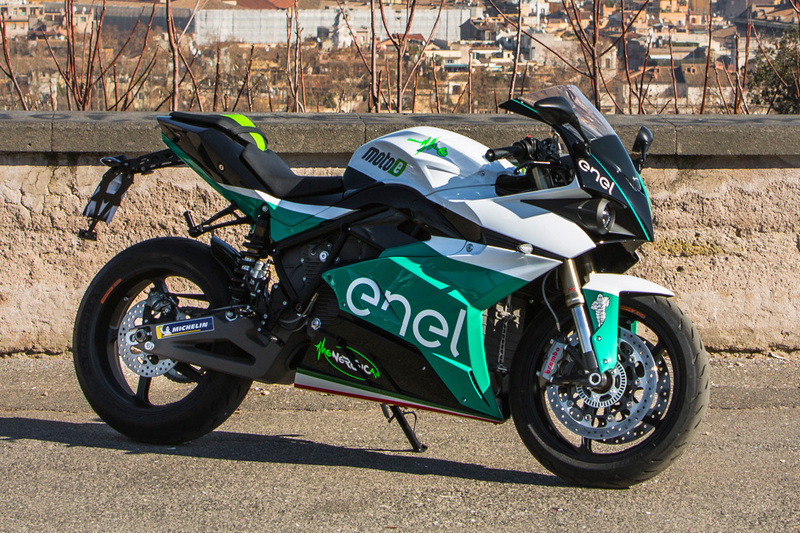 Next year, the MotoE series will feature 18 of these Energica Ego Corsa electrics, capable of speeds tickling 155 mph. This year, MotoGP is having guest riders take parade laps aboard the Ego Corsa at each round of the series. I had the opportunity to attend the MotoGP race in Austin, Texas, where Colin Edwards took the Ego Corsa for a spin; and while it was much quieter than a fire-breathing MotoGP machine, it certainly didn’t look slow. While Moto-E is definitely an exciting development in the world of electric motorcycle racing, it’s not the first e-bike racing class. In fact, the birth of Moto-E, in some small fashion, lends itself to other forms of e-bike racing around the globe. Most notably the Isle of Man TT. The TT Zero is a one-lap race of the famous Isle of Man course done entirely on electricity. 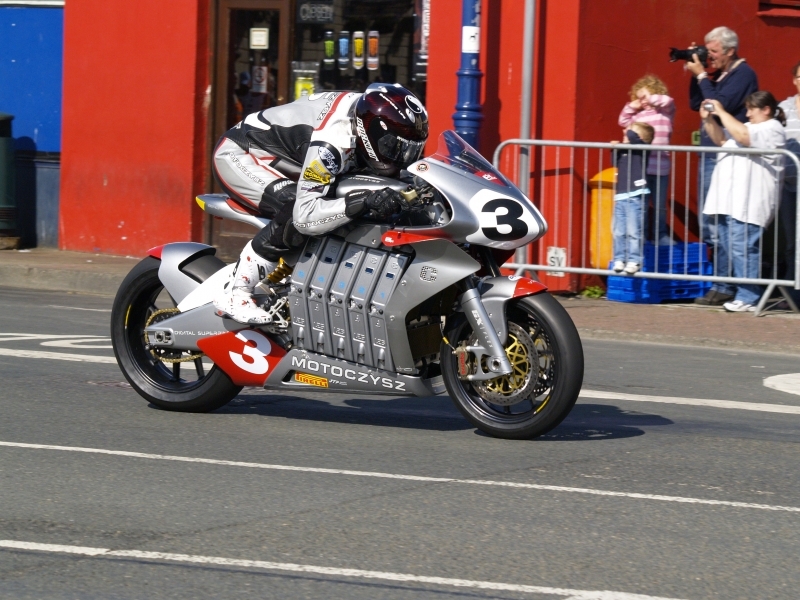 American Mark Miller, aboard the American MotoCzysz E1pc, would go on to win the 2010 TT Zero race. A special moment, no doubt, but it paled in comparison to the MotoCzysz vs. Mugen battles that started two years later. Domestically, the Pikes Peak International Hill Climb has been another venue where e-bikes have had a chance to compete, this time directly against their internal combustion counterparts. In 2013, Carlin Dunne, aboard the Lightning LS-218, won the motorcycle division outright, adding more legitimacy to electrons being as fast – or faster – than gasoline. This year, 2018, the Pikes Peak entry sheet lists three electric motorcycles competing. Lastly, the eMotoRacing series is a true club racing series dedicated solely for electrics. Racing production e-bikes (predominantly from Zero or Brammo/Victory) with a few college projects thrown in, eMotoRacing is where you’ll find home-grown, highly modified versions of the bikes you can find in the showroom. The kicker is that it runs concurrently with AHRMA – or the American Historic Racing Motorcycle Association. Yes, you read that right, eMotoRacing, arguably the future of our sport, shares the paddock with the oil burners of yesteryear. 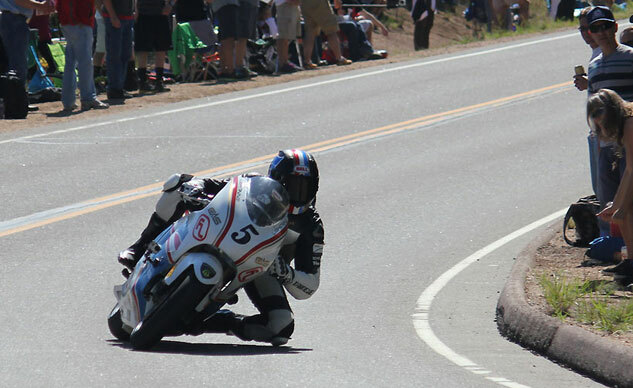 Carlin Dunne, riding the Lightning LS-218 en route to winning the motorcycle division at Pikes Peak in 2013. To date, electric motorcycle racing hasn’t caught much steam either domestically or internationally. Mugen’s involvement at the Isle of Man is a good start, but Honda has yet to announce what, if any, relevance that project will have for production models. Ultimately, racing is about leading the way in cutting edge technology. If Moto-E produces some good racing, and manufacturers see the series as grounds to develop, there’s every chance the series could see the popularity its four-wheeled cousin is experiencing.